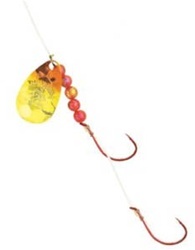 Hot metallic "fish-scale" blades makes these the top spinner rigs for walleye, bass, perch, and pike. Highly reflective blades deliver maximum flash, to pull fish in from a distance. Built on a 48'' leader of 14-lb. Trilene® XT with premium Mustad® Ultra Point™ hooks, the Crawler Spinner Harness features two #4 hooks.